The average ticket price for properties in Dubai may be coming down, but so is the space on offer inside many of them. Executives at Dubai South feted the launch of phase one of The Pulse on October 1, whose cheapest units were advertised at Dh280,000 – considerably lower than prices in other parts of the city. Even Danube Properties, whose founder Rizwan Sajan was passing on savings by supplying goods from his building materials business at cost, was charging Dh430,000 for its cheapest studios at its Starz development in Al Furjan. So how did Dubai South achieve such a feat at its first residential project as master developer? The number of units on sale at that headline price was only a fraction of the total on offer. One broker last week said that 10 units went on offer at the lowest rate, out of about 300. Both of these figures were referred to Dubai South, but it did not respond to a request for comment. The main factor in Dubai South’s favour is likely to be the cost of land, which is cheaper in less prime, inland locations such as its site. However, smaller unit sizes also played a part. 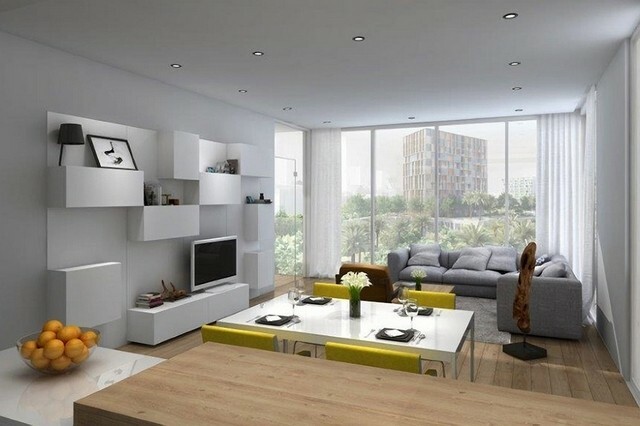 Listings for the Dh280,000 studios show a built-up area of 400 square feet. Craig Plumb, the head of research at JLL Mena, said that alongside Dubai South, developers were looking at areas in Dubailand, Jebel Ali and Al Qudra Road as locations for cheaper units. According to the broker Cavendish Maxwell, of the 5,579 units completed in the third quarter of 2016, 81 per cent were apartments and the bulk of these were built in inland locations – the top three destinations were Dubailand, Dubai Silicon Oasis and Jumeirah Village Circle. Research carried out by JLL last year set the benchmark for affordable homes at Dh780,000 for a two-bed unit. Select Group is one developer that has opted to go down the route of offering smaller units. When it launched its Residences at Marina Gate project in Dubai Marina two years ago, prices started at Dh1.3 million for a one-bedroom apartment. This week, its Studio One project offered studio apartments in Dubai Marina from Dh574,000 and one-bedroom units from Dh899,000. “It just depends on the size,” said Rahail Aslam, the chief executive of Select Group. For instance, existing one-bedroom apartments the company has built in the Marina range in size from 600 to 900 sq ft. The studios in its new development start at 360 sq ft.
About 80 per cent of the units in Studio One are either studios or one-bedroom apartments, and 65 per cent were pre-sold before the launch. “The buyer profile for the stock that we have sold so far has been a lot of investors that like rental yield,” said Mr Aslam. At the recent launch of SRG Holding’s Marquise Square development in Business Bay, Adam Price, the managing director of the master sales agent Select Property Group, said that when compared with typical rents in the area, its (slightly larger) studios offer yields of about 9 per cent. The average investment yield for Dubai apartments was 7.5 per cent in the third quarter, according to Cavendish Maxwell. Matthew Green, the UAE head of research and consultancy for CBRE Mena, said that the smaller ticket prices prove popular with investors, even though they equate to approximately the same price per square foot. However, the yields being quoted to investors may be more difficult to achieve as the supply pipeline increases. CBRE’s second-quarter report on the Dubai market, predicted that about 48,000 new homes are due to be delivered by the end of 2018, with the bulk of these being in Dubailand, Jumeirah Village, Business Bay and Dubai Silicon Oasis. Moreover, the yield comparisons being made are with existing units, which tend to be much larger. Mr Green said that occupiers, whether buyers or renters, are accustomed to much bigger unit sizes in Dubai.